A camping pillow inside your tent can make a huge difference between a comfortable camping getaway and a sleepless night out in the wilderness. You can never replace such comfort and luxury with a pile of clothes that may be dirty or smelly. Camping pillows come in several varieties and qualities – from luxury to micro fleece-lined insulated versions to affordable, inflatable plastic bubbles. The best camping pillows though, stand out from the rest and they have a number of common traits that are the reason for their success and we will briefly discuss each one of them in the later sections of this post. 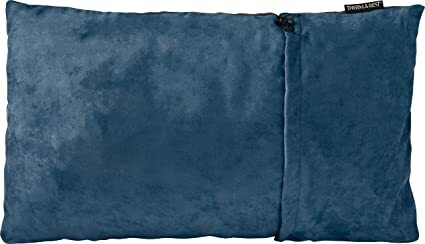 While one can do without a camping pillow, I highly recommend that you bring one in your next camping trip if you want to have nice and comfortable sleep. After a great adventure our in the wild, your body needs to rest, recover and stay healthy and sleep can enhance all of that. Pillows are extremely personal; even the best ones. With numerous options available, we are aware how difficult selecting one can be. With our review of the five bet camping pillows, we verified the models that actually work best for certain needs. So take the time to read this post to choose the best camping pillow for your next camping trip. 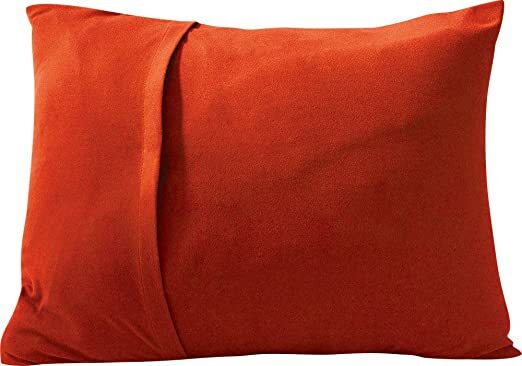 The Therm-A-Rest is a cheap and well-sized compressible camping pillow with travelers and campers in mind. On the inside, it is made from ultra-soft urethane foam filling and on the outside, brushed polyester. It comes in various sizes, so it matches every head size, but if you need a more comfortable, sound sleep, consider buying the XL size, measuring about 16.5x27 inches. 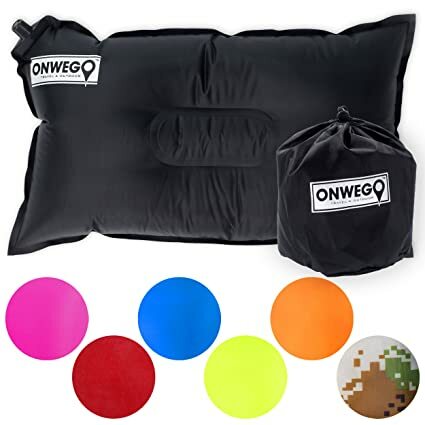 ONWEGO camping pillow is a dense, foamy pillow wrapped up with a smooth pillow top for all-out comfort anywhere. This pillow is ergonomically made to support the head and offer just the proper level of neck support. Made with comfort, relief, and ease in mind, the adaptable safety air lock valve allows you to deflate and inflate the pillow consistent with your desired firmness without the hollow sensation the majority of inflatable pillows have. 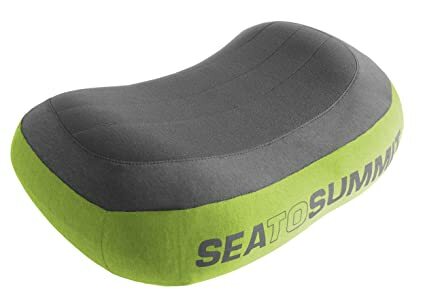 Sea to Summit Camping Pillow is a portable and inflatable pillow tailored with a contoured shape and multifunctional valve for optimum comfort. It includes a polyester knitted fabric that provides the product with a pillow-like appearance and feel. It drives away dampness while you sleep, thus keeping you comfortable and cool all night long! 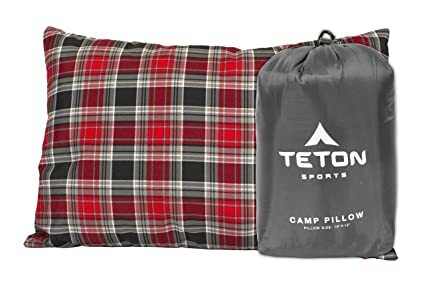 The Teton Sports camp pillow is a light, compressible pillow with SuperLoft Elite 4-channel fiber fill, which is the same material utilized in the sports sleeping bags of the brand. Perfect for backpacking, camping, trekking and hiking, this camping pillow only weighs 0.8 pounds, so it is easy to carry, and it’ll save you backpack space as it squeezes to a small square! This popular Compressible Pillow is ideal for everybody from car campers to international travellers. Its foam filling can be packed small but can expand big, with the XL size that measures a 16.5x27 in. (42x67 cm) for home-like relief wherever you are. Whenever you’re planning to go on holidays or a trip for the weekend to celebrate or attend festivals outdoors, you may not see a convenient environment to stay in. You may require a tent for camping. You’ll need a good sleep after a tiring day. However, sleeping with nature isn’t an easy task to get. If you’d like to have a good sleep in the night, you’ll need a thing that makes you at ease. Perhaps, a soft bed can have a vital part, but the pillow is the most vital thing you’ll feel. A comfortable pillow in camping can make the holidays best. I suggest that you to purchase the ideal camping pillow and have fun on your weekends. Best camping pillow can decrease your exhaustion and make you feel as though you’re sleeping on your bed in your home. It will decrease your neck pain, and you’ll feel better. Inflatable pillows are meant to be inflated with air when needed. If filled, the pillow offers adjustable support at any time. When deflated, it can be folded, thus saving you backpack space. This design is ideal for camping as it is lightweight and portable. Compressible pillows are pillows for camping that can be compressed with other stuff when needed. It isn’t as portable as the inflatable pillow as it doesn’t lay flat once stored, but it does offer more support, so it is much comfier than inflatable pillows. In fact, it’s useful because taking those huge pillows for camping is a difficult task to do as large ones bring in more weight. So to decrease your backpack`s weight, you need one. What kind of pillow for camping do I prefer? It is up to your own preference. If it were I, I’d choose inflatable pillows as they take less space and they can just be placed anytime and anywhere. Do these pillows cause allergy problems? A few pillows can be dangerous, but you have to check which the ones that are ideal camping pillows. Products stated above are extremely clean; these products do not have threats to allergy problem. The material is one of the most necessary factors you need to consider while purchasing best camping pillows. Best camping pillows must have quality materials so that it can guarantee your ease. As you’re going on camping, you must concentrate on your packs’ weights. To keep your packs light, you should buy the lightest camping pillow as much as possible. The right pillow for camping should offer enough neck and head support that you do not wake up with muscle pain when you wake up! Choose camping pillows with adaptable support to adjust the support just how you like it. At the end of every trip, you probably won’t want to find any problem with your camping pillows or else. So you must take user-friendly products into mind that’d give you no trouble. The attributes and size of the pillow you’re seeking depend on your camping packs’ desirable size as well. You do not want to be troubled with a faulty product that you can’t use so ensure you get a pillow for camping with brilliant warranty offers. Certainly, sleeping outside is different from sleeping in the privacy and comforts of your bedroom that is why special equipment is required to get a restful slumber. And this gear is a pillow for camping! A camping pillow contains durable materials, so it’s great for use in intense weather conditions. Also, the material is intended to provide enough support on bumpy terrain. Additionally, camping pillow is portable; it will not take much space in your backpack! Best camping pillows can make a difference in your camping trip. If you’re planning a camping journey, do not be late to purchase the best pillow camping. Aside from camping, these gears can be utilized while traveling as well!